Vector Art Services can full fill all you needs of digitizing and art work and ensure you best quality and turnaround time. Give a new look to your old logos and paintings with raster to vector image conversion. An unclear raster image can be converted to a vector image to impart a brand new look. Raster to vector conversion ensures better usage and resizing. At Image Clipping Path, we use the best vector creation software and convert raster to vector, which transforms your image to give a classy look. 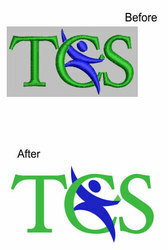 RSDIGITIZE provide quality embroidery digitizing and vector conversion service with reasonable price. We are specialize in converting raster image to high quality vector images without pixcels. For new customers, first digitizing and vector orders are absolutely free. Conversion of raster image into vector for making it possible to cut with Vinyl Plotter. Convert any raster or jpg image into vector for using it with any platform like flexisign pro etc. We will send you the vector file by email you provided. Price may vary after interpreting the hardness of the work. Raster to Vector conversions is a method to convert documents into electronic formats, which enables them to be efficiently stored in a secure form.